See, Eilmer the monk was kind of a nerd. He made him some wings. They really were neat! Then Eilmer climbed up to the top of of the church. The ground was down there, but he was up here! Poor Eilmer cried out, “I was doomed to fail! So this one - I ran across some notes I made about Eilmer a long time ago. I thought this little historical snippet was interesting and wanted to turn it into a story. Alas, I could not figure out a framing that was actually compelling. "And then he crashed. The End." There was not an uplifting (ha) ending, nor an obvious moral. There was a small punchline, but it wasn't up to carrying the story's purpose. Then all of a sudden, Charlie Daniels is drawling, "The millennium had just gone by, and Eilmer of Malmesbury wanted to fly," in my head, as if it were taken out of "Uneasy Rider." I started composing the thing as I was driving, and I couldn't quite remember "Uneasy Rider"s structure, and by the time I got to "two handfuls of hope" we were firmly in Shel Silverstein-esque territory. The meter has definite bobbles in places, but I actually rather like them. Particularly "Oh joy! It worked!" - going from... what are they, anapests? to iambs... sort of opens up the metrical space, just like Eilmer is flying high and free. It's the definite climax of the poem. Some of the other places, it's less intentional, but it still serves to keep it from being too tumpitty-tumpitty-tump. I think. I don't know if I like the "See" at line 4 - I put it in to regularize the line's meter, but it really isn't necessary. Also not sure about "nerd" - I mean, I think it works and it's funny, but it's a very very modern slang term, so it's a little jarring. This miiiight be a 'kill your darlings' line. I was trying to make it a song - because who doesn't like songs? - but it really seems to want to be a spoken-word poem. So here it is. Archive.org's copy of William of Malmesbury's Chronicle of the Kings of England, where Eilmer's flight is first recorded. USAF memorializes Eilmer incorrectly as the first manned flight. There are earlier Chinese and Arabic sources claiming gliding flight from towers. There are several articles and maybe a book by Lynn White Jr that get into the technical details of how Eilmer could plausibly have actually done what William says he did. This is an early version of the work - I think the latest is from 1978 and might contain more info. I cannot recommend anyone re-creating Eilmer's flight as part of an A&S project, though! Malmesbury, in England, has a small website for Eilmer. The spot where he is said to have crash landed is now an alley called Oliver's Way. (French chroniclers miscopied his Saxon name as Oliver at some point, and it stuck.) The abbey bookstore doesn't seem to have an online presence, but you can buy their pamphlet secondhand. Sigurth and Brynhild came out really well. I decided to make it singable, and want to lay out the process as I'm currently exercising it. I still compose poetry on paper, not orally. The next few steps go much more easily if I've got the poem in memory. Also lets me work aloud and in the car. I tried to pay close attention to my vocal pitches, as used in recitation. Where were the natural lifts and falls, and could I use that to guide the melody? Recitation didn't unlock a perfect melody. I turned to an older idea I had. Alliterative verse (English and Norse) contains four stresses per line, with unstressed syllables placed according to several templates. The meter is defined, but not regular. So my approach is to assign four pitches - one per stress - and then use linking notes to fill in the unstresses. Pickup notes appear and disappear at will. Generally, after I work through the poem, a general pattern emerges. I could definitely do this on the harp, visualizing the placements of the notes by looking at/playing the strings. Since I was using commuting time, I imagined the notes. I started with a "high, low; high, low" pattern for the first line of each quatrain. That sounded too firetruck-siren-y, so I modified my image of the pattern to "high, low; medium, low." Suddenly, it came out sounding much better. Interestingly, it also suddenly took on a home-and-away character, entirely unintentionally. I thought maybe I was doing "re, la; fa, re." Turns out it was "la, re; mi, re." "re" is my home/tonic in Dorian mode, so its dominant is "la" - I expect them to go together. "Fa" is in their family too. The associated "away" is do-so, with "mi" associated. Since the Norse verse uses quatrains, I thought I'd have four lines of melody. Well, three - I intended to have the melody for line 1 and line 3 be the same. I came up with a pattern that seemed to work. Start to Practice It. Work Out the Details. Practice shakes out a bunch of things. I lost my second line of melody and started using a melodic couplet, repeated, for each quatrain. I am still not sure how I feel about this. My test audience of one did not find it too repetitive/cloying, but I am not sure. I found where my literary ways sabotaged me. Syllables that I designated as stressed in the written poem did not always come out stressed as I sang through it. English being what it is, in all cases but one, I can shift emphasis without putting a stress on an obviously unstressed syllable. Example: I was singing "THAN my own LIFE," when I needed an m-alliteration. "than MY own LIFE" is what was meant. That's a valid way to stress that sentence - it's not like my old "pork CHOP, pork CHOP" problem. On the other hand, I should not have alliterated "aMEND" with "misTAKE". It sneaks by on paper, but becomes very obvious when sung. I found the places where I wanted to vary the melody, mostly for dramatic emphasis. One of the nice features (? I think it's nice?) of this style is that I can vary the notes for my unstresses to keep it from being too monotonous. (I'm sort of thinking of the runo music I've got... the structure of that is probably a different post.) But there are a few verses where I just entirely replaced the first line of music. Brynhild is angry in this song. I sing her lines in an angry voice. Someone using the traditional ballad performance style (very little emotion expressed) would skip this, obviously. I just got to this stage. I first try to find my melody on the strings - that's the only way I can figure out what the accompaniment should be. I still use very simple open fifths - "re la" underneath those parts that operate at "home," and "so do" under the "away" notes. Mostly. The short excursion to "away" in the first melody line doesn't seem worth trying to cram an accompaniment shift - there's a little dissonance but that's okay. The second melody line goes "do so do re" - it's entirely "away," until the final stress brings it home. I'm still new to singing with the harp, so this part is challenging. I'm working on pacing the accompaniment so it lines up with the stresses in the melody. Also, the first time through, it made it weirdly difficult to perform the "variant" melody lines I mentioned in bullet 3, above. Hoping some practice clears that up. Written for the Sir Gyrth Oldcastle Memorial Poetry Smackdown at KASF 2018. I drew on the Volsunga saga and the Poetic Edda for the material. The verse is allegedly the Norse eddic fornyrðislag . What illness strikes strongest of women? Why to her bed does Brynhild go? I've had a bit of an itch to write a nostalgia song. I've been in the SCA for over half my life; I think that's long enough to legitimately look back on "way back when" with some rose-colored stained glass windows. "Way Back When" was indeed the working title under which various ideas were banging around my head. The general idea was that way back when, I didn't know crap, and so my persona/presentation/garb/experience was more unfiltered. I didn't know what one was 'supposed' to do, and my direction was more in accord with my heart and less with the corporate goals of a 501(c)(3) educational organization. Then I got older, learned more about the community standards, and began conforming to them more. Much was gained, but something precious was also lost. Then one day, leaving work, "It was magic, you see" popped up in my head as the intro for the evolving refrain. And when I got home, I sketched out a draft lyric. It was... not what I thought "Way Back When" was going to be. It presented a personal evolution, taking a good deal of the bitterness out of "Way Back When" by finding magic at every stage. Only the final, backwards-looking verse/refrain reflected on the particular early magic that was lost. It's not bad - it's in fact much more optimistic - but I also feel like I weakened the emotions I was going for. Like I was walking back some of the honesty. Except that the original "Way Back When" wasn't entirely honest, either. Nobody held a handgonne to my head and told me to up my A&S game. I did change partly out of respect for the community standards, but mostly because one day I fell unexpectedly head over heels for early period stuff. It's a different experience than the one I had when I first joined, but it's not any less dear to me for all that. So "It Was Magic" is also true. And on the gripping hand, it's not like this is an autobiography. I'm writing a song that's inspired by my own experience, but the "poetic I" does not have to be the confessional, authentic I-myself. I suppose I could try writing both and see where they go. Written when Badouin and Grielle stepped down from the thrones of Storvik in July 2016. They had overseen several upgrades to the baronial infrastructure, including heated showers and the purchase of new thrones. It's Christmas vacation! So I finally sat down and scribbled out a rough draft of the song I said I'd write after Pennsic. Really rough - there are lines where there's a crappy rhyme and a question mark, because I know that isn't adequate, and lots of other issues too. But that's why it's a draft. I may, for once, also try to write a totally different draft of a different song, because I generally cling to the first thing I make when maybe I should explore some other options. Contrary to usual habit, I am not posting my draft. I am still trying to figure out what to do with the song in general. It's like this - the song is about the wondrous, perfect Atlantian Royal Encampment at Pennsic 44. Now, in actuality, Atlantian Royal was a large yellow and white-striped rental pavilion, a gate, and a few panels of sheet wall. It was empty; their Majesties elected to camp with Their household. Considering that Their household is probably also Their main support staff, and that probably the household didn't want to lose its traditional land if everyone camped at Royal, and that Pennsic breeds a fondness for tradition, I can see the reasoning there. And at a very deep and personal level, I don't care a single bit what the Atlantian Royal Encampment does or does not look like. I don't camp there. The opinion of the Known World on the subject is entirely irrelevant to my life. But - there are people who do. People who felt this lack of Royal Encampment was an embarrassment of the Kingdom before the Known World. And it was from some of these folks from whom I heard that 'there oughtta be a song about this.' And the idea of an 'Emperor's New Clothes' sort of thing came to me, and it seemed too good not to do. BUT is it really worth poking at Drama on a topic I don't actually care about? I do believe that bards in the SCA should feel at liberty to use their position to offer critique on the Society, when it deserves it. If I felt strongly about this, I'd be posting the draft. But I don't, and I don't know if I really want to pile on to their former Majesties - I'm sure they've heard quite enough on this topic already. As lost as lost could be. The best of souls have stayed. That reach from East to West. Of stewards, you are the best. There’s peace in every part. Now many know my name. To serve yourself, the Dream. To serve you was their quest. Your beauty and your worth. Are folk both good and kind. Your flag I’ll keep and guard. My muse, my skill, and my timeline couldn’t agree on this one. I did an A&S project on Anglo-Saxon goldworked pennons back in October, and I’m good with Old English verse. But the lady/steward conversation, and particularly the steward’s initial refusal of reward, doesn’t fit with the mead hall ethos. It felt like it would work better as a troubador lai. But then I got to be in a hurry to write it for the deadline, and when I sat down, a ballad came out. Ballads, rhyming poems in English with an ABCB scheme and (roughly - there are many exceptions) 8-6-8-6 iambic meter, date back to the 15th century. I scoured Master Gregory Blount’s Sixteenth Century Ballad site for some references to back this piece up. Ballads cover a lot of ground - love songs, songs about Queen Elizabeth, bawdy songs, anti-papist songs. Without pretending to do a survey of common tropes or themes, I did find one example of a dialogue between a lord and lady, and an example of two abstract ideals conversing. my ioy and onely blisse. which trumpet so doth raise. good Princes downe did race. che did full often zee. At least three goldworked banners are mentioned in Beowulf: burned for Scyld’s funeral, given to Beowulf by Hrothgar, and in the dragon’s hoard. The famous French standard, the Oriflamme, literally means “golden flame,” and is depicted in art as a red banner with a golden sun or flame upon it. Most extant examples of opus anglicanum, English goldwork, are ecclesiastical accoutrements, such as the Maniple and Stole of St. Cuthbert. It reached its height as an art form in the 12th-14th centuries, but ballads frequently dealt with antique subject matter (such as the ballads of Robin Hood). Goldwork is either done by surface couching gold threads to fabric (early) or using couching stitches to pull a small bubble of gold thread to the reverse of the fabric, creating a joint that makes the finished piece more flexible (later). It’s a legitimate period embroidery using threads of gold. This is a collection of links to transcriptions or scans of extant ballads, or 19th century reprints of 16th cen. manuscripts. Jill Ivy. Embroideries at Durham Cathedral. Robert Attey and Sons: Sunderland, England, 1992. It was a good war. A bit odd for me - not one class given or taken! But a good war. Bread: There are beehive ovens popping up all over Pennsic! I was aware of at least three. I did not get to the open Bread Day at Aethelmarc Royal, alas. My own bread went fairly well. I brought King Arthur bread flour, and it made a huge difference. The loaves baked up much higher. Loaf One sat directly on the coals and the bottom burnt to a crisp. However, it was easy enough to cut pieces off, and it was tasty. Loaf Two used foil balls inside the Dutch oven to elevate the springform bottom. It rose so high it touched the lid, burning the top slightly. The bottom only had a few scorch marks and was largely edible. Morgan felt this one was not as good as the first, although I couldn't tell a difference. Loaf Three used large (2") foil balls to support the oven above the coals, and this seemed to work the best of all. I learned from Meisterin Johanna that when you thump bread, it should be on the bottom of the loaf. In all cases, I used more coals than the recipe book called for - essentially, ALL the coals I used for the preheat. I did arrange them in open circles, to prevent a central hot spot, but I did have ~15 on the bottom and ~30 on the top. One-Pot Stews: My Eadric the Potter bowls worked great! I did a (canned) chicken stew with fresh onion, carrot, potato, sage and parsley, and it was super-delicious. Also surprisingly good was the bean dish - cannelloni beans, tomato paste thinned with enough chicken stock, onion, garlic, chopped summer sausage, and I think more parsley. The Italian-accented shrimp and grits was the least good, but I still ate most of it - canned shrimp with lots of garlic, onion and some summer sausage (standing in for bacon) sauted in a lot of olive oil in one pot (on the Coleman stove - the others were done on coals) and then polenta cooked up and grated Parmesan cheese stirred in. Put shrimp on top of polenta, stir in and serve. The canned shrimp sort of shredded into a onion-y, garlicky protein gloop with occasional grits of sand. There was too much polenta. It wasn't bad, but it wasn't particularly good, either. Espresso: I am currently of the opinion that a 2-cup espresso maker is the ideal camp coffee maker for one. Strong coffee, fast! Not so good if one were brewing for an entire camp. Lunch Salads: Several days, I made salads of cold chopped stuff. I brought a jar of "Sun of Italy" marinated mushrooms, and one of kalamata olives, and they were worth three times what I paid for them. 'Shrooms, olives, cannelloni beans, sausage, sharp cheese, and basil made a filling lunch. Ice: For future reference: When it was warm-to-hot, the little cooler needs one 7-lb bag of ice per day. It was just big enough to hold a quart of milk, some bits of cheese, my yeast, and some leftovers (unused onion, beans, sausage). Used up: 4-6 oz cheese, 1 summer sausage, 1 jar each mushrooms and olives, 1 can beans, 1/2 small can tomato paste, 1 onion, several carrots, 2 cans chicken, 1 can shrimp, ~6 garlic cloves, 1 'juice box' chicken broth, 1 quart milk, 1 lb. hazelnuts, 1/2 bag Post Shredded Wheat, 1/3 can Melitta coffee, most of a 5-lb bag of flour, yeast, salt, pepper, fresh herbs, 1/2 c. oats, cinnamon, 1/2 c. polenta, 3 snack bags of Cheez-Its. Plus assorted snacks from Cooper Store. 1 32-pack of water. Brought home: 1 can black beans, 1 can corned beef hash, 1 'juice box' vegetable stock, all the bulgur wheat, the rest of the oats, polenta, and bread flour, all the lentils, all the canned fish (sardines and anchovies - not brave enough to try them), unused coffee, cereal, extra lb. hazelnuts. The other 32-pack of water. Verdict: Overpacked on grains, but all told - not bad! Particularly pleased the cheese - which was carefully measured out as "whatever is in the fridge the day we leave" - lasted. Special note: I never used the honey, and the ants found it. Ziploc! Bowl and Pitcher: THIS WAS THE BEST. Simple, effective, not messy. The sump was close enough that I just emptied the bowl each time, didn't use the slops bucket. For modern hygiene purposes (e.g., hand washing after every bathroom trip), the sink with running water was easier/better. But this worked well for morning/evening wash-ups in my own space. Also good for washing the veggies! Camping Pad: The Exped MegaMat 10 LXW only needed topping off once - the patch held all war. (Huh, I didn't realize they had a 25" wide version. That would have probably been enough for me.) It does need a natural fiber layer between mat and me - a sheet did not cut it, so I used a folded-over length of wool. One layer of Army blanket would do it. The fitted sheet didn't really stay well-tucked, and the top sheet kept pulling up. I think I should make some items with elastics to secure them, and/or which are sewn to each other. Sleeping on the floor still works, but it is starting to get old. A cot or rope bed might be something to look into. Washing: The microwave bacon tray made a reasonable washboard. I only did a load of small items; this War wasn't sweltering, so I was able to re-wear big garments without stink. Bras, I rinsed out in the shower each day, and that seemed to work. It wasn't that much work, and I would do this again as a way to pack smaller. Cooler Covers: Reed mats were meh. Wooden hidey-boxes would look the best, but fabric covers (with that shiny insulation stuff?) would pack the best. Or go Full Cariadoc and go without. I am having vague ideas of multiple smallish A-frame canvas tents - one for adults, one for kids, one for gear? - and a tarp. Have to see what can fit in a reasonable footprint. Then we have a camp that's modular for our family - just me (one tent), me and Husband (sleeping tent + gear shelter), entire family (+ kid tent). Beowulf: Crammed it all back into my head in time for performance on Wednesday at the Harp Symposium. I felt it went really well! I also did it, in parts, at the Atlantian Royal Bardic, and for Master Dolan Madoc of Calontir, in camp. He had participated in other readings of Beowulf in the SCA, so one of my camp-mates brought him over to hear me. In return, he told a wonderful story of William Marshall. We really need more tales of history, and of the big period legends. Southwind Bardic: We had a really great bardic in camp. Yaakov kicked it off with his long-form story, which was very well-told and a lot of fun. Then around and around we went. 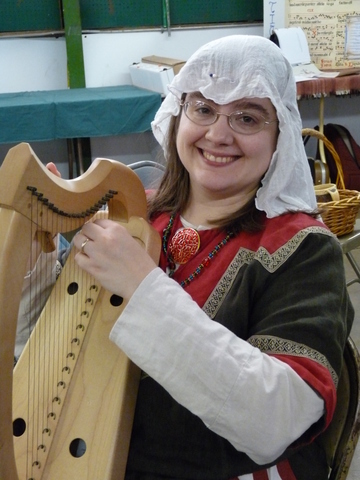 We had everything from tales of Ye Olden Days in the SCA to some filks to period stuff to original compositions. I got to take... 4 turns? Which was enough that I didn't feel stifled, and not so much that I felt like I was running roughshod over it. Known World Poetry Competition: I got the days confused and thought this was on Tuesday, not Monday, and so missed it. Master James informed me that he really liked my entry, but it lost by 4 points. Considering how lousy my documentation was, I think that's fair! Poeta got 4 entries, which sounds like a number similar to what I got when I did it, back in 2009ish. Why can't poetry get more traction? Known World Harp Symposium: Enjoyable as always. Mistress Linette did a great job of wrangling the scheduled performers and the ad hoc sign-ups. We had pure instrumental music, accompanied song, wire and nylon harps - and one great carbon-fiber harp! - and my recitation. Some of the performers snuck in a bit of education/lecture, too. Mistress Fevronia did 'Queen of Air and Darkness,' which I remember hearing at my first Pennsic. Still gives me shivers. UnLove Songs: At the Southwind Bardic, one storyteller commented that "the theme of the evening seems to be love." And I thought about it, and no, it wasn't. It was "Women as Reward" pieces - women who marry a man so he doesn't die of love, women handed out as prizes by their fathers. (And I don't except myself from this theme, as I did 'The Perilous Bed,' wherein the maiden is given to Sir Gawain by her father.) So I think I want to write something poking at this. Their Majesties' New Camp: We camped across from Atlantian Royal, the most glamorous and ornate encampment at War. Knights in full regalia guarded the gate, which stood, turreted and tall, with archers upon it for defense. Within lay carefully planned paths through a garden sprung up as if by magic, with picture-perfect pavilions flanking it. An enormous camp kitchen housed a long trench of a fire, over which entire hogs and legs of beef turned on spits, while six Laurels prepared subtleties to amuse the eye and the tongue. A full staff of heralds, trumpets in hand, announced each visitor flawlessly, with their complete and most accurate title and name, no matter where in the Known World they hailed from. Before the thrones, perfectly well-behaved children, adorable in their tiny garb, played merry games while a consort of musicians played the songs of long ago. Wandering minstrels recited poems and told stories, each a masterwork, neither too short nor too long, neither too dull nor too unseemly. All this, and more! You saw it too, didn't you? Of course you did. They say that such wonders could only be beheld by those true to the spirit of the Society, so I am sure a fine gentle such as yourself looked upon these marvels with a glad heart. Oh yeah. This is gonna be a song. For my work as Storvik Chronicler, I was recognized with the Opal at Royal Court. More importantly, on Tuesday evening, Meisterin Johanna accepted me as her protege. This might seem somewhat odd, as it did to me when she first suggested it. After all, I do more art than service, I think. But I am not looking for a Laurel. Not because I think I have nothing left to learn - far from it! - but because I feel confident charting my own path on the voyage of learning it. She proposed a more general mentoring relationship, and as I find much admirable about her, I thought it best to accept. I deeply, deeply hope this does not bother any of the other Peers whom I respect and admire.